Since 2015, Stéphanie Bonneau, doctor in podiatric medicine, has been offering the best service to our podiatric clinic located in Longueuil, South Shore of Montreal. In order to always satisfy you, we remain on the lookout for the latest technological advances in podiatry by offering you innovative orthotics that can be worn in all shoes. You can also consult us if you suffer from an ingrown toenail, plantar wart or if you need a foot care. Our clinic aims to provide you with concrete results that have a positive impact on your daily life. The Clinique Podiatrique Stéphanie Bonneau in Longueuil is always at the cutting edge of technology. Our podiatrist offers you innovative orthotics. Indeed, according to your needs, it is possible to make you custom-made orthotics that will follow you in all your daily movements with their durability and thinness. They are thin enough and flexible to be worn with high-heeled shoes and easily adapt to all types of shoes. The Clinique Podiatrique Stéphanie Bonneau in Longueuil prescribes, custom builds and modifies your orthotics, for your comfort. To benefit from it, it is not necessary to have a prescription from your general doctor before a consultation. Your satisfaction and the improvement of your quality of life being at the heart of our concerns, we also offer a postural imaging system that promotes a better understanding of your situation and allows you to study your posture for a better follow-up over the years. Our podiatrist also offers laser therapy for the treatment of nail fungus, plantar fasciitis, sprains and bursitis. The Clinique Podiatrique Stéphanie Bonneau in Longueuil can also help you with the care of the nails and the skin of your feet to prevent diseases such as fungal infections, ingrown toenails or plantar warts. In addition, we treat the pain of your feet. Our podiatrist also treats children. In fact, we offer a pediatric service to children who are prone to conditions such as plantar warts, flat feet or even certain malformations. Our podiatrist has the skills and qualifications required to detect the slightest condition associated with feet. We are therefore able to discern a podiatric pathology and to treat it properly. 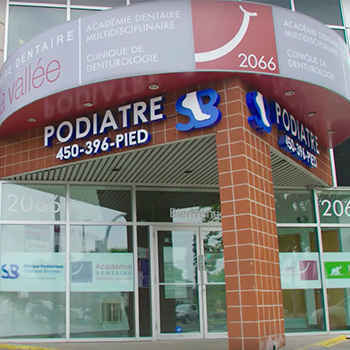 Most of the care provided at the Clinique Podiatrique Stéphanie Bonneau in Longueuil is covered by private insurance. A graduate of Université du Québec à Trois-Rivières, Stephanie Bonneau, DPM, earned a doctorate degree in Podiatric Medicine. She continued her studies through an internship at the prestigious New York College of Podiatric Medicine (NYCPM). Originally from the South Shore of Montreal, she made her debut at the Montreal Podiatric Clinic and now opens her clinic in the city of Longueuil. She also works simultaneously at the DIX30 Clinic. Driven by the practice of her profession and her community contribution, Dr. Bonneau, a podiatrist, made a commitment in 2014 to the Quebec Association of Podiatrists as secretary. Also, the humanism and the listening which characterize her are the proof of a practice centered on her patients as well as on their needs.